To achieve something huge, there is a process to be followed and steps to be taken to reach it. If you were to accelerate it, there would be repercussions. For a football club, the pinnacle of glory is to dominate European and Domestic football. Some clubs take 50-60 years to build up to it, others have a great year and succumb back to normality. For Chelsea, this process was to be accelerated. With such a big investment by Abramovich, the stakes would also rise just as frantically. Naturally, this meant that huge problems were inevitable for the club. After a successful start through Jose Mourinho, Chelsea suffered a period of discontent and insecurity. Doing better domestically meant that European dreams would also be influenced. In a span of 5 years Chelsea’s aims would go from merely qualifying for the Champions League to winning it. These expectations proved challenging to a somewhat inexperienced board and management. The drawbacks of this were most evident during what we can now call the era Interim Managers, years 2007 to 2009. Some of these appointments were mere placeholders to give Chelsea’s recruitment process more time, others were flashy signings that never lived up to the hype. Either way, these appointments caused an inferno of problems all around Chelsea. Chelsea experienced the discomfort of not hiring the right man for the job first hand, so in hopes to not have a repeat, they appointed Luiz Felipe Scolari in the summer of 2008, thus beginning the most troublesome season for the Club. 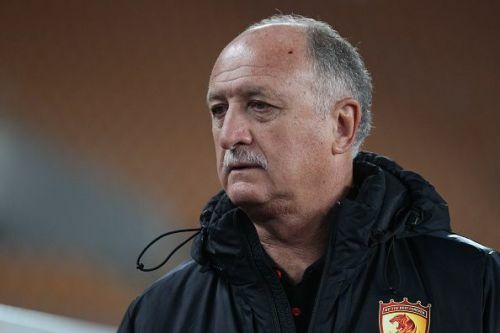 Scolari was a popular and recognized manager, having achieved international success when winning the World Cup with his native Brazil and reaching the final of UEFA Euro 2004 whilst in charge of Portugal. It was in-fact during Euro 2008, that he would announce his decision to take over Chelsea for the 2008/09 season. With his recent success on the international stage, it was the hope that his success would transpire into club football, within the gauntlet of The Premier League. He was the first World Cup-winning manager to manage in the Premier League, on paper, this looked like an exciting appointment. It was sensible to think that a more experienced top-flight manager would be a perfect figure to divert any future managerial problems Chelsea might suffer and bring peace to a troubled changing room. Proceedings began on the front foot under the Brazilian. Portuguese midfielder Deco was bought for around £8 million from Barcelona, and in Scolari’s first pre-season with the club, the Blues defeated Chinese side Guangzhou Pharmaceutical 4-0, a 7-0 victory against Chengdu Blades followed, and a tournament-winning 5-0 thrashing of Milan culminated a successful warm-up for the domestic league’s opening in August. Things didn’t slow there, Scolari began with a 4-0 home victory over Portsmouth in the first league game of the season, kicking off an 8-game unbeaten run. His first loss eventually came against Liverpool on October 26, 2008, a 1-0 home defeat. Chelsea would soon respond with 13 goals for, and 0 against in their next 5 games, highlighting the fun and attacking style of football Scolari was known for. Unfortunately, tough times weren’t far. When a 2-1 home loss came against Arsenal, this signaled what was to be the beginning of the end. 3 draws in their next 5 followed, against lowly opponents such as West Ham United, and cross-town neighbors Fulham, all before another top 4 clash loss against Manchester United. Just 3 games later, Liverpool would defeat Chelsea once more, 2-0 at Anfield. Scolari’s job was on the line when Chelsea hosted struggling Hull City at Stamford Bridge on February 7th. A 0-0 draw followed, toxicity surrounded the SW6 club, frustration was growing, and Scolari’s time was limited. Just 2 days later, “Big Phil” was sacked as Chelsea Manager, the club citing “the results and performances of the team appeared to be deteriorating at a key time in the season,” as the fundamental reason for this decision. Despite being a more popular appointment amongst the fans than his recent predecessors, Scolari could not thwart the problems at Chelsea and was sacked just 7 months after he was hired. After a flying start to his season with a 12-game unbeaten run, by January, he could not set Chelsea as serious contenders for the title, lying 8 points away from the 4th place when sacked. His agent later went to say that Scolari had a team that was unchanged for 4 consecutive years and he was not allowed to bring in younger players, which was one of the reasons for his demise. Some saw this as another sign of inexperience from the board, others saw it as ruthless ambition from Abramovich. Chelsea desperately needed some calmness and peace within their ranks and someone who could buy them enough time to find a proper long-term manager. 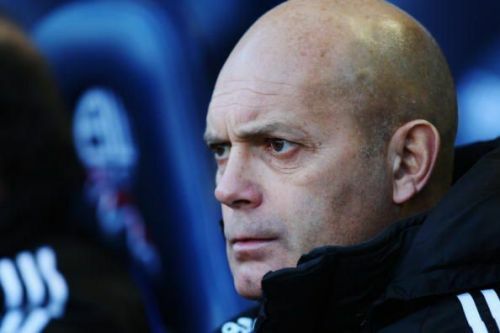 It was agreed that an ex Chelsea player would be a good and cheap option to delay proceedings and give the club a much-needed sense of relief, and all that accumulated to the appointment of Club legend, Ray Wilkins. Wilkins had recently returned to the club as an assistant first team coach to Luiz Felipe Scolari after Steve Clarke left to join another club legend in Gianfranco Zola at West Ham United, this was Wilkins’ first involvement with the club since leaving under Claudio Ranieri’s order when Ranieri was hired in November 2000. Ray officially took over as caretaker manager on February 9th, 2009, whilst the club’s background search of a more permanent leader continued. Just two days into this search, Russian national manager Guus Hiddink was named as temporary Chelsea manager until the end of the season. In Wilkins’ only game in charge, a Nicolas Anelka hat trick against Watford at Vicarage road gave Chelsea a 3-1 victory and a place in the FA Cup quarter-finals against Coventry City. Whilst his period only lasted a total of 6 days, the importance of his presence was exactly what Chelsea needed, familiarity and a real Chelsea man. Whilst it became clear that in the current environment it was almost impossible to hire someone and envision a long-term future with them, another outside appointment was made. The board decided to move their aims from the long term to short term and see off the 2008-2009 season. Guus Hiddink was presented to the Chelsea fans with the target of finishing the season off on a good note, that being at the minimum, finishing in the top four. Hiddink’s first game in charge was a 1-0 away victory against Aston Villa. On February 25th, Stamford Bridge welcomed Hiddink as Chelsea manager for the first time, a UEFA Champions League knock out tie vs Italian giants Juventus. Hiddink’s side went onto win this game 1-0 and successfully proceed past Juve with a 2-2 away tie in the corresponding fixture. Back in the Premier League, Chelsea went onto win 3 games in a row, before losing to bitter rivals Tottenham Hotspur away on March 21st, Hiddink’s first loss in charge. 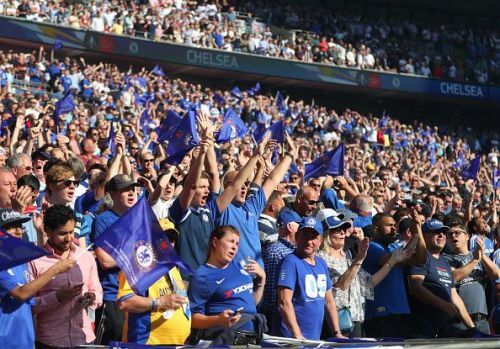 Chelsea were still challenging for the FA Cup also, a 2-0 win against Coventry, followed by a 2-1 win at Wembley against Arsenal set them up for a final clash against Everton on May 30th, again at Wembley Stadium. Prior to this, however, there was much to do in the Premier League and UEFA Champions League. Chelsea responded to the loss against Tottenham in the league with a 2-0 victory at Newcastle United, before a highly-anticipated European quarter-final battle against arch-rivals Liverpool. Chelsea went to Anfield, scored three crucial away goals, and won the away leg 3-1. A mouth-watering 4-4 battle at Stamford Bridge followed, with Chelsea progressing to the Semi-Finals against Barcelona, with a 7-5 aggregate win. 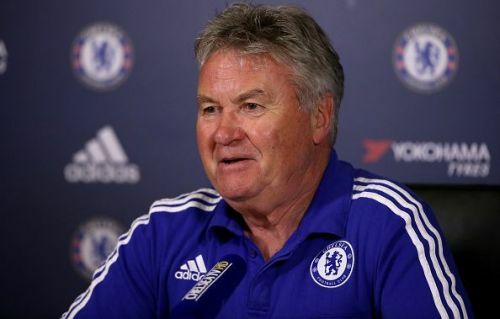 Many commentators stated after the win over Liverpool that Hiddink had rejuvenated Chelsea following Scolari’s departure. Unfortunately, a 93rd-minute equalizer from Andreas Iniesta in the second leg at Stamford Bridge conformed Chelsea to a European exit. This game is typically remembered for the somewhat-absurd officiating from referee Tom Henning Ovrebø, who controversially turned away four viable penalty shouts for Chelsea in the game. Despite their European heartbreak, Hiddink and his Chelsea side proceeded to win their final five games of the 2008/09 Premier League season, confirming a third-place finish and subsequent birth in the 2009/10 edition of the UEFA Champions League. In Hiddink’s final game at Stamford Bridge, a 2-0 win over Blackburn Rovers, Chelsea home fans chanted Hiddink’s name throughout the match and called for the club to “sign him up” on a permanent basis. Whilst it was typically the results that pleased the owner and fans alike, Hiddink’s highly positive attitude was thoroughly appreciated amongst the Chelsea faithful. In Hiddink’s final game in charge of Chelsea, he won the 2009 FA Cup by beating Everton 2-1, thanks to comeback goals from the re-born Didier Drogba and Frank Lampard, despite an early setback from Louis Saha’s opening minute goal. He claimed in the post-match interview that it was one of his biggest achievements in his illustrious coaching career, and the plaudits soon followed. Fundamental characters such as club-captain John Terry, Michael Ballack, and Petr Čech all advocated for Hiddink to stay on as Chelsea manager, publicly voicing their desire to have him return. Despite their best efforts, Hiddink always stated that he intended to return to his post with Russia, one of which he was continuing whilst in temporary charge of Chelsea. The players at Chelsea proceeded to gift Hiddink an engraved watch and a shirt signed by all of the players. Despite a topsy-turvy story on and off the field, Chelsea ended the 2008-2009 season positioned third in the Premier League, they reached the Semi-Finals of the UEFA Champions League and went onto win the FA Cup. Given the amount of discontent and confusion Chelsea had suffered internally, they still managed to consistently perform and achieve good results. This became a huge factor in the appointment of Carlo Ancelotti in the summer of 2009, who brought the long-sought stability to Stamford bridge and ended much of the chaos from the past years. Opinion: Can The Maurizio Sarri Project Work At Chelsea? Pep or Mourinho? Who's the real 'Special One'? Premier League 2018-19: What is going wrong with Chelsea?